Now it will be easy to express your love by using DRPU Love and Romantic Photo Frame Maker for Free. 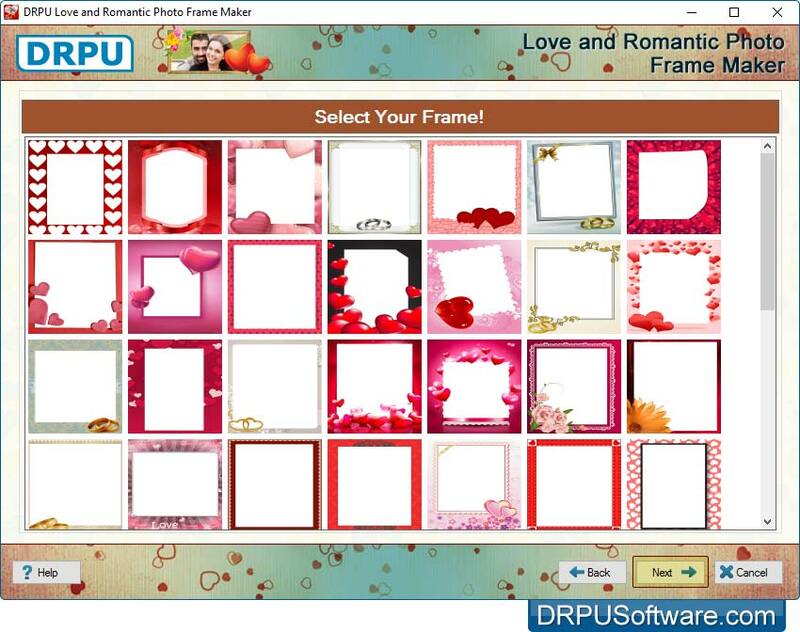 DRPU Romantic Love Photo Frames is specially design for people who are in love to capture romantic moments in lovely photo frames. You just need to browse your photo, select any of the wide collection of romantic photo frames and wrap your picture with romantic photo frames. You can also send your 'photo with frame' to the specified email ID via E-mail with the help of inbuilt E-mail settings. Download this Romantic Love Photo Frame Maker app and start exploring its functions and have great fun together with your loved one NOW ! Install 'All in One Photo Frame Maker' Freeware App to Add Any Type of Photo Frame on Your Photos. Option to browse image from library or you can also capture photo using inbuilt camera while adding frame on your photos. Image Cropping Tool to crop multiple images as per your requirements while adding frame on your photos. You can save photo with frame in different file formats including GIF, TIFF, Bitmap, JPEG, PNG and PDF. 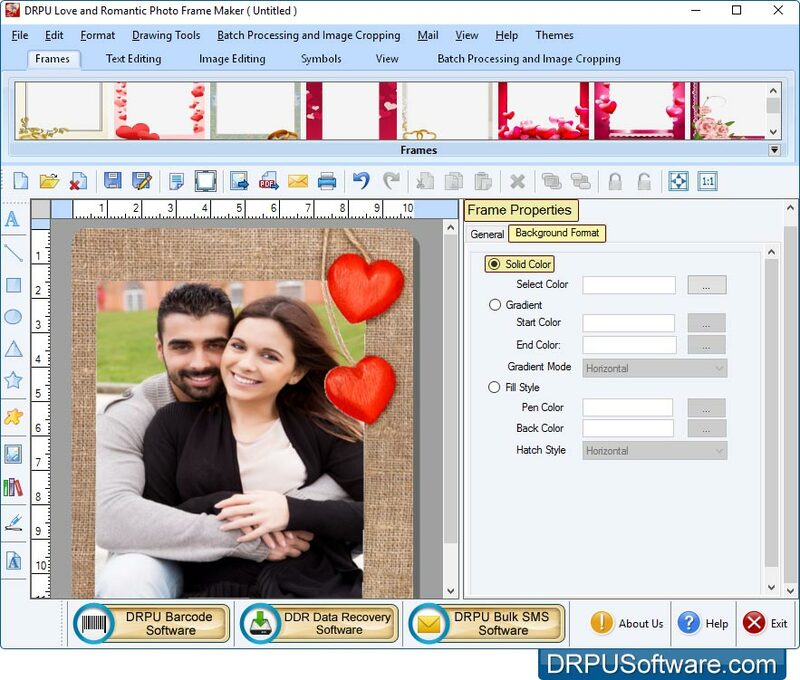 Generate and print multiple Love Romantic photo with frames with different pictures and text value using 'Batch Processing Series' option of 'DRPU Romantic Love Photo Frame Maker' App. Print setting option to print photo with frame with support to all major types of printers. You can easily export designed birthday cards as pdf and as image. 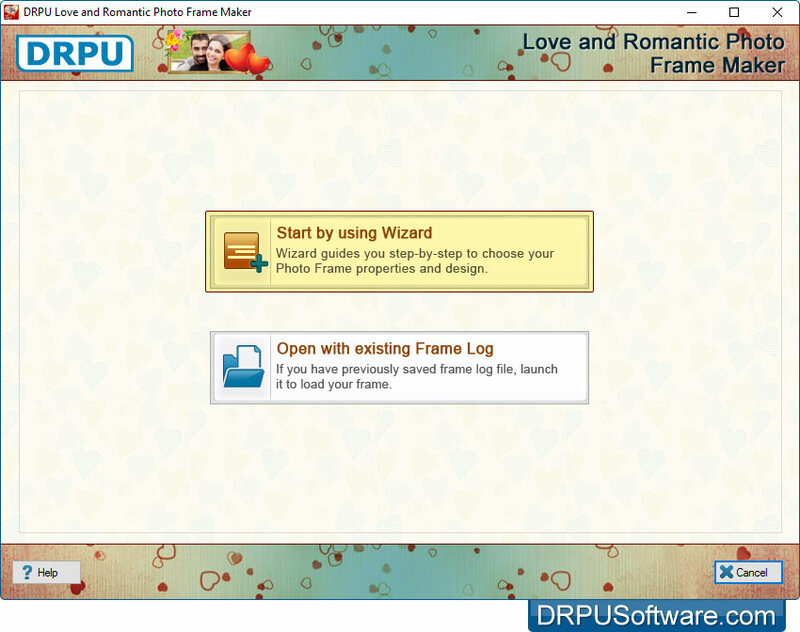 Choose option either 'Start by using Wizard' or 'Open with existing Frame Log'. Select Frame you would like to add on your photo and click 'Next' button to continue. Browse photo, to which you want to add frame. You can also capture photo using inbuilt camera. You can adjust frame settings including frame background solid colors, gradient colors, transparency etc. To print decorated photo with frame, set all print settings and click on 'Print' button.